Kim Wilde - born Kim Smith on 18th Nov 1960 in Hertfordshire, UK, daughter of 50s singer Marty Wilde. Released her debut single Kids In America in 1981 at the age of 21. The song was written by her dad and her brother Ricky, ironically Kim had never been to America at the time. Kids In America was a huge success in the United Kingdom and around the world (UK no. 2 hit). 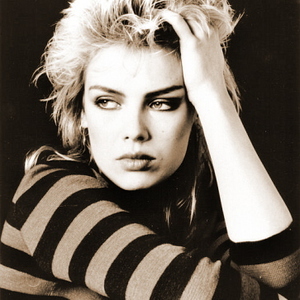 Her debut album Kim Wilde (released on RAK records) was released in July 1981 and stayed in the UK album charts for 14 weeks, peaking at number 3. Two more hits from her debut were released Chequered Love & Water On Glass. Her second album Select (released May 1982) contained more hits Cambodia and View From A Bridge. Her 3rd album (and last album with RAK) Catch As Catch Can was released in Nov 1983 and was not a huge success (Love Blonde and Dancing In The Dark from the album were only minor hits). When Kim signed with MCA records in 1984, many believed that her run of hits were over - they were wrong. Kim's first album with MCA, Teases & Dares (released Nov 1984) was not a huge commercial success but was a huge success with critics and fans alike. It included 3 hit singles including Rage To Love, her first top 20 hit in 2 years. In Oct 1986 Kim released a cover of The Supremes song You Keep Me Hangin' On - it was a huge hit, number 2 in the UK and in the singles chart for 14 weeks, even better the song got to number 1 in the USA. Kim was now a superstar around the globe. Another Step (her 5th studio album) was released in Nov 1986 and spent 5 weeks in the UK charts. The title track Another Step (Closer To You), (a duet with Junior) and Say You Really Want Me were also singles. In June 1988 Kim released her most successful studio album to date Close which spent 38 weeks in the UK album charts. Close contained 3 top ten hits You Came, Never Trust A Stranger and Four Letter Word. Around this time Kim was the support act on Michael Jackson's huge Bad tour. Her 7th and 8th albums, 1990's Love Moves and 1992's Love is did not match the success of Close, however Love is boasted another top 20 hit single with the Rick Nowels penned Love Is Holy. In September 1993, MCA released the first 'official' greatest hits album called The Singles Collection 1981-1993 (which contained all her biggest hits from the RAK years as well as the more recent MCA hits and two brand new singles If I Can't Have You, a top twenty hit in July 1993 (a cover version of the Yvonne Elliman classic) and the Kim penned In My Life. In 1995 Kim released her 9th studio album Now and Forever, it was not a hit album in the UK but suffered no promotion. It contained two top 50 hits Breakin' Away and This I Swear. In 1996 Kim released Shame, a cover of the disco song made famous by Evelyn "Champagne" King. Unfortunately the song failed to dent the UK top 100. In 2001 to celebrate the release of another greatest Hits album Kim released a new song Loved, co-written by Ronald & Masterton who are famous for their work with Dannii Minogue. Sadly Loved failed to enter the UK singles chart. Kim is still making music and is also equally famous for her gardening skills. She continues to have success in Europe and had a huge hit in 2003 with Anyplace Anywhere Anytime, a duet with Nena. As of 2006 Kim is working on a new studio album. The Album will include new tracks and some remixes and remakes of classic Kim songs such as You Came, Cambodia and Kids In America. Also for the new album called Never Say Never Kim has re-recorded You Keep Me Hangin' On as a duet with Nena.